State Treasurer Walker Stapleton still appears to be the frontrunner for the Republican gubernatorial nomination with less than six weeks to go until the June 26th Primary, but the wheels are coming off when it comes to Stapleton’s signature issue of PERA reform. The pension became the centerpiece of discussions during this year’s legislature, buoyed by rallies by Colorado teachers who demanded fixes to the system in addition to better pay and school funding. …in a speech last weekend made to El Paso County Republicans, Stapleton said the legislative measure “shored up” PERA for the time being. “I have been the longest, largest, loudest voice for reforming PERA, and as a result of Republican leadership, we have shored up that system for 500,000 public workers in the state of Colorado,” he said, according to a video recording obtained by Denver7. [Pols emphasis]. First off, it is a pretty big mistake for Stapleton to publicly say that PERA has been “shored up” by the legislature. Stapleton has spent the last eight years trying to convince voters of his PERA expertise; if he is admitting that PERA reform is no longer a critical problem, then Stapleton needs a new shtick for the General Election. …When asked to respond to the accusations made against Stapleton, a campaign spokesperson who agreed to speak on the condition they not be named admitted that Stapleton did not attend the May 3 PERA board meeting, but said a deputy called in to the meeting. The spokesperson said that wasn’t out of the ordinary, which one of the sources Denver7 spoke with confirmed. 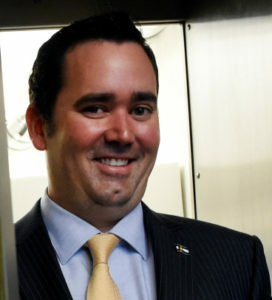 And though another group that has focused on PERA’s liabilities and opposed Stapleton’s work on PERA in the past, Secure PERA, found that Stapleton attended 53 percent of board meetings from 2011 through 2016, a Denver7 review of board meeting minutes from 2017 show that Stapleton attended eight of the nine meetings that year, missing only one on the first day of a three-day retreat. Stapleton’s intermittent attendance at PERA board meetings is not a new revelation, though it boggles the mind that he has continued to make it so easy for opponents to attack him on an issue he has been screaming about for years. If he does win the Republican nomination for Governor and tries to keep PERA reform as a top issue, Stapleton will also have to explain why he has been ignoring one of PERA’s biggest problems — the hundreds of millions of dollars being siphoned off by Wall Street fund managers for financial advice that consistently underperforms benchmarks. Stapleton’s campaign website says that he “will bring the same persistence in fighting for economic reform to the Governor’s office as I have shown as Treasurer.” He has a tough task ahead of him convincing voters that this is a good thing. The average (non-public employee) could not tell you anything about PERA. 560,000 Colorado employees (all public school teachers, law enforcement, firefighters) does not equal mouse nuts. Yes, I know Colorado's population is 5.6 million. However, public service employees have a much greater impact in terms of interacting with your "average Coloradans". You want your kid's teachers, the judge who listens to your plea, the first responder who answers your call, to have some investment and security in their job, and not to be a "temp" just marking time until they can get into something better paid. Apparently, neither can the (below) average Colorado State Treasurer? BTW, ”Mouse nuts”? Is that a boomer reference you have to be of-an-age to understand, and that I should just ignore? What? Money? You wanna talk about money? I know money. I am, of course, rich, which proves it. But weren’t you born rich? so, like the only thing you had to do to be rich was, you know, stay alive? They may not be able to tell you everything … but given the press about it, there are a number of people who know that there was a huge need to shore up the system, which had a $30 – $50 Billion shortfall. When they know 1 in 10 Coloradans are currently part of the system, that means that some of their neighbors probably are. And those involved have spouses and children who are also concerned, boosting the odds even higher. When they hear the kids' teachers have 2% more of their salary taken as "contributions" — their teachers' retirement is delayed by 6 years — and (if I understood a comment I heard at a forum I attended today) they will be denied Cost of Living adjustments for the first 3 years of their retirement — they wonder about the dimensions of the "shared sacrifice" passed by the legislature over the objections of Walker Stapleton.